Mayan priests were closely linked to the Mayan nobility. In early Mayan societies, the rulers and the leaders also carried out priestly tasks and duties. In some cases, Mayan kings were directly required to perform priestly duties and to carry out rituals in order to earn the divine sanction for their rule. In many Mayan cities, the noble class was directly connected with the institution of priesthood and any new priests came from the nobility. Priests enjoyed a powerful influence in Mayan society because of the fact that the Mayan society had a religious outlook, steeped in its mythological beliefs. According to Mayan sources, the earliest Mayan ancestors of the civilisation didn’t have any set institution of priesthood and rather carried out the sacrifices and rituals on their own. In the later Mayan periods, the Kingship automatically became a divine institution and Kings were by default expected to be involved in priestly tasks. In many cases, the role of the administrator and the priest was combined in the duties of the Mayan king. In many Mayan sources, direct priesthood is not mentioned. This is understandable because in many cases, the nobility of a city automatically assumed the role of the Mayan priests. 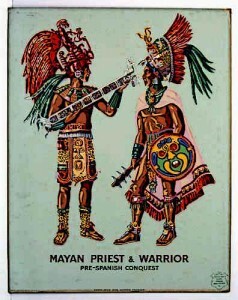 Mayan priests were closely linked to the Mayan nobility. At the top of the Mayan institution of priesthood stood the high priest. The high priest was tasked with overlooking the writing of the books, appointment of new priests and inauguration of the ascension of a new king. High priest also looked over priestly knowledge such as that of the Mayan calendar and the Mayan script, and performed important rituals. Directly under the high priest came the office of the town priest. Unlike the high priest, the town priest had to deal with more day-to-day matters. He was, for instance, charged with the administration of sacraments, carrying out of sacrifices and rituals, preaching of the festival days as well as divining at many occasions. The town priest looked over both private and public rituals. They were further assisted by four old men. Other influential priestly offices included that of the oracular priest, often called chilam. Oracular priests often made use of herbs and possibly hallucinogenic materials for their rituals. Religion in the Mayan society pervaded all aspects of the society. From birth to burial and marriages to sports, religious rituals accompanied all events. And these rituals were often looked over by the priests. They presided over the burial rites of the nobility and performed the task of reading and writing the books of the time. Since the priests had astrological and astronomical knowledge, the masses relied on their divination for many things. The priests told the people the right time to harvest and they helped them choose the right dates to marry for example. Priests also overlooked sacrificial rituals performed on top of the pyramid-temples. They had exclusive control of mathematics, astronomy, astrology, writing, Mayan script and Mayan calendar. So the Mayan educational system was effectively overlooked by the priests. Mayan priests had a special interest in astronomy. By observing the celestial bodies closely, they were able to predict certain events and pre-calculate the movements of different bodies. This helped them create their calendar, which was one of the most complex calendars in human history. Astronomy also helped the Mayan priests direct the agrarian Mayan society. An accurate astronomical knowledge helped Mayan priests tell the Mayans the right time to harvest certain crops. Such advice was critical for the Mayan society which subsisted mostly on its agricultural produce. Early Mayan priests came directly from the Mayan nobility. The nobles regularly served in the temples and performed priestly tasks, including sacrificial rituals. Over time, however, a somewhat separate priestly hierarchy came to be established. This was especially made possible by the accumulation of vital knowledge in the hands of the priests. Once such hierarchy had been established, sons of priests and second sons of nobles were usually the ones who joined priesthood. Since the first sons of the nobility inherited the riches, the second sons had a chance at power and influence by becoming priests. The office of the high priest was hereditary. Mayan priests wore different kinds of dresses in different times and different Mayan cities. Historical sources such as Mayan art reveal priests attired in long robes and wearing feather hats with a very broad rim. Postclassic sources reveal priests as dressed in long and heavy vestments, wearing feather jackets with ribbons hanging from them. In the Mayan pantheon of gods, the upper god Itzamna was considered the patron of the priests. Mayans considered Itzamna the first priest and the first writer, so he was more closely associated with the task of writing. Another Mayan deity concerned with the priests was the Howler Monkey God. This deity was concerned with the divination of the priests. Mayan civilisation faced a major disruption in the wake of the Spanish conquest. Epidemics ravaged most of the population and what little remained had to take refuge in forests and places away from the conquistadors. The normal structure of the Mayan priesthood was also disrupted. Since diseases were a major concern at the time, herbalists and providers of cures assumed the religious office. Although they were called “craftsmen” in Mayan, they became village priests. Over the years, these priests also carried out sacrifices and performed prayers for the people. Mayan priests were a very important part of the Mayan society where religion played a major role. Originally, the priests came from the nobility and not a separate institution. The King himself was considered a combination of the ruler and a priest, and had to be connected to the temples or the priestly tasks in order to validate his divine right to rule. The priests developed and guarded vital knowledge and sciences, such as knowledge of writing, the Mayan script, the Mayan calendar, astronomy, astrology, mathematics and divination. By combining this body of advanced practical knowledge with their divine position, the Mayan priests assumed a powerful role in the Mayan society.